SPECIAL OFFER: MAYBE IT WILL RISE FROM THE DEAD? 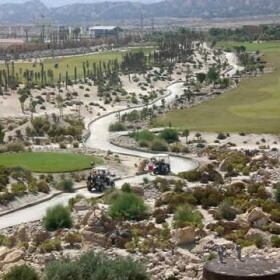 Mosa Trajectum Golf, located near Murcia, is the first 100% ecological golf course in Spain. 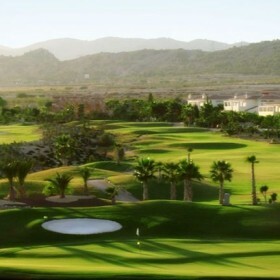 It has three 9-hole courses: “Stone”, “Olive” and “Pine”, which you can easily combine into an 18 hole round. It also has an extraordinary 9 hole par 3 Challenge Course. On the Stone Course, 22,000 cacti, 8,500 palm trees and a see of flowers form a unique and impressive surrounding. The landscape changes as you go along, especially around the so-called “pebbled rivers”. Strategic players will have an advantage here, and long hitters will have to contain themselves and use short irons to obtain good results. For the Olive Course, the design team sought to design an authentic link course ) and integrate it into the regional landscape. 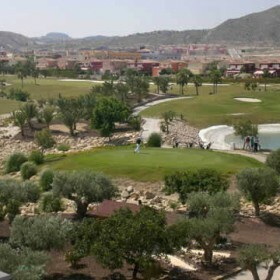 Hundreds of olive trees and other typically Spanish trees and flowers make this course a special one. The high brushwood and six carefully chosen grass types provide a pleasant environment. Unless you don’t like high grass, obviously. On the Pine Course, water hazards and pine trees guard the lush fairways and greens. This course requires skills and course management, but can be enjoyed by players of all levels. Mosa Trajectum is one of the best and most environmentally friendly golf courses in Europe, and the only 100% ecological golf course in Spain. For example, water use is reduced by 70% by an innovative drainage system that collects all of the rainwater. Located 13 km from Murcia, Mosa Trajectum has a 27 hole championship course (Stone, Pine & Olive Courses) as well as a par 3 (Challenge Course). The championship course runs through the resort, through a spectacular and challenging landscape with a variety of plants and trees, cacti, open rock faces and a multitude of water features. Stone, Gents 3174 m, Ladies 2455 m, par 36. Olive, Gents 2819 m, Ladies 2194 m, par 36. Pine, Gents 2951 m, Ladies 2283 m, par 36. Challenge, Gents 863 m, Ladies 693 m, par 27. Handicap: 36, Gents and Ladies.